During 1966 and 1967 the National Aeronautics and Space Administration launched five Lunar Orbiter spacecraft to obtain photographs from orbit of the surface of the Moon. The reconstructed photographs and support data are now on file at the National Space Science Data Center (NSSDC), Goddard Space Flight Center, Greenbelt, Md. The purpose of this Atlas is to present a selection of these photographs which provides essentially complete coverage of the near side and far side of the Moon in greater detail than any publication now in existence. A summary of the five missions is given in table 1 (p. 19). The first three spacecraft essentially satisfied the primary objective to obtain high-resolution photographs of proposed Apollo landing sites. The fourth spacecraft systematically photographed the near side of the Moon and the fifth spacecraft completed the far-side coverage. The primary emphasis was not only to support the Apollo program but also to provide more detail in many areas that have been studied from Earth-based observations. At the average spacecraft altitude of about 3000 km for the photographs contained herein, the resolutions of the two cameras were approximately 500 meters and 65 meters; whereas under favorable conditions, Earth-based photography of the Moon can reveal details only as small as 500 to 1000 meters. Figure 1.-Lunar orbiter spacecraft in flight configuration. All the Lunar Orbiter photographs have been reprocessed from the original video data tapes. Special attention was given to the Atlas photographs to insure high quality and uniformity of appearance. They are presented here as 300-line-per-inch halftone reproductions (plates 1 to 675). The halftone negatives were prepared by the Army Topographic Command (TOPOCOM). The Lunar Orbiter photographs have been referenced to the lunar surface by a complete set of index maps which permit identification of those photographs showing a particular site or area. The Apollo zone photographs and the Atlas photographs have also been referenced separately by two additional sets of index maps. The index maps were prepared by the Aeronautical Chart and Information Center (ACIC). An alphabetical listing of prominent lunar features is given which will aid in the location of these features within the Atlas. A bibliography has also been included to refer the interested reader to additional information on the results of the program. The Lunar Orbiter spacecraft is shown in flight configuration in figure 1. Detailed information regarding the spacecraft can be obtained from documents cited in the bibliography. Since the photography cannot be fully interpreted without an understanding of its origin, the photographic subsystem is herein discussed in detail. The primary elements of the photographic system (fig. 2) were a dual-lens camera, a film processor, and a readout system. The 80-mm focal-length lens provided an angular coverage of 44.4º by 38º. The 610-mm focal-length lens photographed a small area, centered within this field, with an angular coverage of 20.4º by 5.16º. (See fig. 3.) To distinguish between the two exposures, those made with the 610-mm focal-length lens are referred to as high-resolution frames (or H frames) and those made with the 80-mm focal-length lens, medium-resolution frames (or M frames). 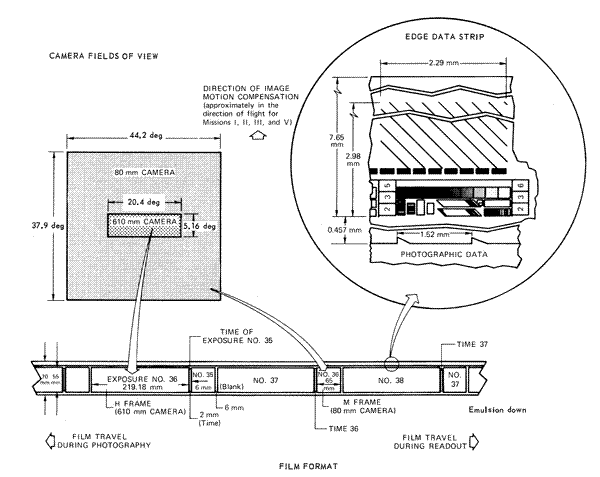 The photographs were interlaced on a single strip of Kodak high-definition aerial film, type SO-243, 70 mm wide and 80 meters long, as shown in figure 3. The SO-243 film was selected because it is relatively insensitive to radiation and, although its aerial exposure index of 1.6 is slow compared with that of other emulsions, it has an extremely fine grain structure. At a contrast ratio of 3 to 1, the angular line-pair resolutions of the recovered photographs were 34 and 4.4 seconds of arc, respectively, for the medium- and high-resolution cameras. Prior to use, the edges of the film were preexposed with framelet numbers, a 9-level gray scale, and resolving power charts. A geometric pattern (fig. 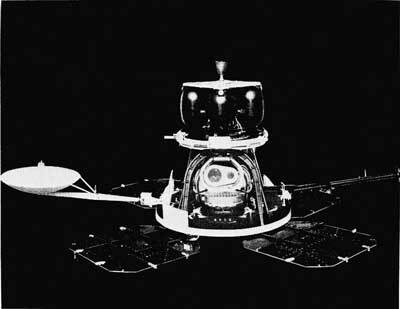 4) was preexposed on the spacecraft film of Lunar Orbiters II to V at the same time as the edge data. This pattern aided in the detection of and compensation for distortion introduced by the processing, readout, and ground reproduction systems. The folding mirror in the optical path of the 610-mm focal-length lens caused reversal of the high-resolution images with respect to the medium-resolution images. This condition resulted in the edge data being turned over when the film was printed in reverse to give properly oriented pictures. Essentially, both lenses opened simultaneously at a fixed aperture of f/5.6. Timing lights which encoded the exposure time were recorded on the film. A between-the-lens shutter was used with the 80-mm focal-length lens; a double-curtain focal-plane shutter, with the 610-mm focal-length lens. Shutter speeds of 0.04, 0.02, and 0.01 second were selectable by transmitted commands. Photographs could be taken as single exposures or in 4-, 8-, or 16-exposure sequences, both the sequence and the time between successive exposures being selectable. Multiple-frame sequences gave an overlap in the direction of flight. The film was held in the focal plane by film clamps and vacuum which held it flat against the platens during exposure. The platens moved the film during exposure to eliminate image smear caused by the rapid movement of the spacecraft over the lunar surface at low altitudes. The platen velocity, which provided the image motion compensation (IMC), was regulated by a mechanical linkage to an image-motion-sensing device, the velocity-height (V/H) sensor. The V/H sensor optically locked on to the image of the lunar surface through the high-resolution lens and caused the platens of each camera to move at the velocity of its image. In a normal photographic sequence, the spacecraft was oriented to the correct attitude, the lenses were uncovered by the opening of a thermal door on the spacecraft, the V/H sensor was activated, and the camera was turned on. 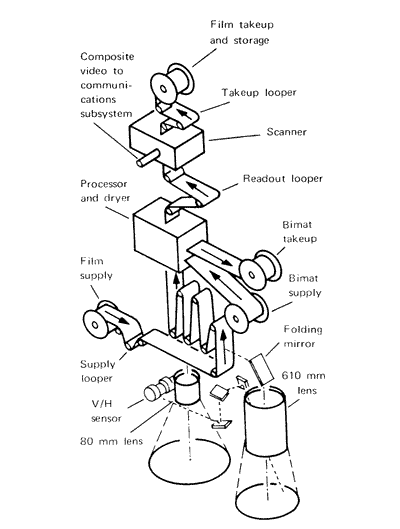 After the "camera on" command, the cameras operated in an automatic sequence to: (1) clamp the film to the platen and draw it flat by differential pressure, (2) start moving the platens in synchronization with the image motion, (3) open the shutters for simultaneous exposures, (4) return to the platens to the rest position, and (5) advance the film for the next exposure. This sequence was repeated until all photographs commanded were taken. After exposure, the film was held in the camera storage looper. The storage looper (fig. 2) consisted of a series of fixed rollers in a stationary carriage and a series of rollers in a movable carriage which rode on a track. As film entered the looper, a spring caused the movable carriage to move away from the fixed carriage; thus, a storage capacity for up to 6 meters (˜20 ft) of film was provided. 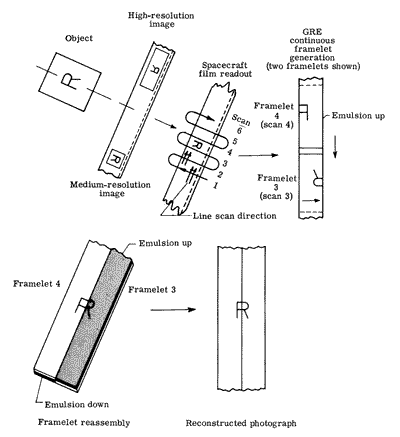 Figure 4.-Preexposed geometric pattern for Lunar Orbiters III, IV, and V.
At the completion of all photography, the procedure was to cut the Bimat film and read out all the photographs by running the film in reverse and taking it up on the film supply reel. Because of limitations on the number of frames that could be scanned per orbit, this procedure required about 2 weeks. However, throughout the mission the readout storage looper provided the capability of reading the last four exposed frames for priority return of important data and for monitoring system performance. The readout section (fig. 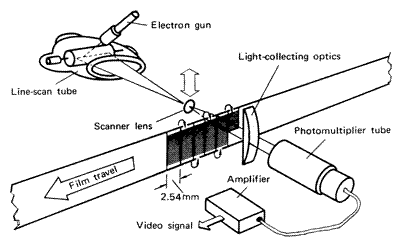 5) consisted of a line scan tube, a photomultiplier tube, and the associated optics and electronics. In the line scan tube, a spot of light, 112 microns in diameter, generated by the electron beam moved linearly across the face of a revolving phosphor drum. Rotation of the drum avoided local overheating of the phosphor, but it did not affect the orientation of the line. The spot was focused by the scanner lens and projected as a reduced image, 6.5 microns in diameter, onto the film where it moved 2.67 mm horizontally in one direction (the return trace was blanked out). The scanner lens moved continuously at right angles to the film edge. The result was a complete scan of a "framelet" consisting of 16 359 parallel scan lines, each 2.67 mm long, across 57 mm of the 70-mm film. At the completion of a framelet, the film was advanced 2.54 mm to allow for an overlap before making the next scan in the reverse direction across the film. A complete dual-exposure frame, 298 mm long, required 117 framelets. The light passing through the film, modulated by image density, was sensed by a photomultiplier tube through the associated light-collector optics. An electrical signal proportional to the intensity of the transmitted light was generated, amplified, and transmitted to the ground receiving station. The received video signal was sent to the ground reconstruction electronics (GRE) where it was converted to a line scan on a kinescope tube. The variations in light intensity on this kinescope tube corresponded to the variations in image density on the spacecraft film. The line on the kinescope tube was recorded on moving 35-mm Kodak television recording film, type SO-349. The image on the 35-mm film was 7.2 times the size of the image on the spacecraft film. After processing, this positive image film was run through a film cutter to remove excess film and the individual framelets were separated. The framelets were then laid side by side on stable-base polyester film to reconstruct the original photograph. Master negatives were made from the positives. A full medium-resolution photograph was reconstructed from approximately 27 framelets and measured 47 cm by 40 cm. The high-resolution photograph consisted of approximately 86 framelets and measured 158 cm by 40 cm. Because this size was unwieldy, the practice was to assemble high-resolution frames into three sections. Photographic reassembly is illustrated in figure 6. Certain imperfections may be observed in some of the photographs. These imperfections are directly traceable to the method of film development, the readout system, the video data, or the GRE system. Most photographs are not perfectly rectangular. This distortion was caused by a misalinement of the line-scan tube with respect to the mechanical scan direction. When the projected line was not perpendicular to the scan direction during readout, and the kinescope trace in the GRE system was perpendicular to the edge of the 35-mm film, then a noticeable tilt could be observed when successive framelets were laid side by side to reconstruct a complete frame. Many framelets appear to have light and dark stripes running parallel to their edges. This effect was due primarily to an inherent nonuniformity in the light output of the scan system in the spacecraft that caused a variation in light intensity and affected the video signal level during a scan across the width of a framelet. Ideally, the level should be constant for a constant film density. In some photographs small-scale streaks appear as bright white lines (see plate 297) parallel to the framelet edge. This condition was caused by phosphor granularity in the GRE kinescope tube. The Bimat technique introduced several development imperfections that are scattered throughout many of the frames. Bimat stop lines (shown in plate 75) and Bimat pull-off lines (shown in plate 144) result from anomalous development conditions which occurred at the entrance to and exit from the development system. Two oval-shaped spots (shown in plate 92) appear near the center of the film and are associated with the location of the Bimat stop line; they follow it by about 10.7 cm (4.2 in.). "Lace" (shown in plate 116) appears as a spotted area of unprocessed film arranged in a random manner. The areas vary in size and location on the film and do not follow any pattern. Because of overlapping photography, the amount of data lost by these processing defects is small; their main effect is the spoiling of the appearance of the photographs. Various other minor imperfections are scattered throughout the photographs. Occasionally, momentary dropout of the video modulation on the transmitted carrier caused extremely fine white lines to appear in the framelets (shown in plate 573). In plate 2 there appears to be an area of double exposure. This condition was caused by a failure of the film to advance completely after a photograph was taken; as a result, a medium-resolution image overlaps a high-resolution image. A few photographs (such as plate 344) have a blurred or out-of-focus appearance that was a result of water vapor condensing on the camera window. Once the problem was recognized, it was eliminated by closer control of the window temperature. Although the electronic nature of the photographic system introduced undesirable defects in the photographs, it also allowed for flexibility during reconstruction. An important example was adjusting for overexposure often evident in the bright areas of the medium-resolution photographs. By amplifying the video signal during reconstruction, photographic detail, lost by normal processing, was retrieved. In addition to the electronic enhancement techniques often employed during reconstruction, photographic dodging techniques were used (in the production of the negatives) to compensate for large density variations within the photographs. The enhancement process, although it increases the information content of the photographs, distorts the photometric fidelity. It is therefore not advisable to draw conclusions based on a comparison of photographic density. A listing of the support data required to analyze the Atlas photographs is contained in table 2. Additional information may be found in the references cited in the bibliography. The positional data are subject to possible future revision. The terms presented in the support data are defined in this section (in the order given in the table). Figure 7 illustrates the geometry of these parameters. Although the primary purpose of this Atlas is to present a complete photographic coverage of the near and far sides of the Moon, an index of all Lunar Orbiter photographs has been included. Figures 8 and 9 (p. 8-13) include mercator and polar projections which display the lunar surface outlines of photographs from the five missions. The concentration of photography in the Apollo landing zones required the front-side equatorial region to be displayed in greater detail to avoid confusion. Any photograph in this Atlas can be located by means of these maps, and the maps also show whether additional photographs are available for any specific area of interest. sequential order of presentation in the Atlas from 1 to 675.
sequential order of exposure on a given mission. distance from the center of the Moon to the spacecraft. distance of the spacecraft above the mean lunar surface; a spherical moon is assumed with a radius of 1738.09 km. selenographic longitude (latitude) of the point on the Moon's surface directly below the spacecraft. rate of change of altitude with respect to time. component of the spacecraft velocity perpendicular to a lunar radial line through the spacecraft and in the direction of the flightpath. azimuth of the principal ground point from the spacecraft nadir. angle between the camera axis and the surface normal at the principal ground point, a level surface being assumed. angle between the camera axis and the spacecraft nadir line. angle between the cross-axis of film frame (the Y'-axis) and a line from the center of the frame to the image of the nadir point (measured positive clockwise from the positive Y'-axis). direction on the photograph of the north vector at the camera axis, measured clockwise from the Y'-axis, which is parallel to the 2-1 and the 3-4 sides of the frame. angle between the spacecraft nadir line and the Sun's rays. angle between the camera axis and the Sun's rays. azimuth of the Sun's rays at the principal ground point, measured clockwise from north. arc length (km) from the nadir point to the intersection on the lunar surface of the Moon center to the Sun centerline. angle between the camera axis and the projection of surface normal into the phase angle plane. angle between the surface normal and the Sun's rays at the principal ground point. distance from the image of the principal ground point to the image of nadir point measured on the spacecraft film (given for both high- and medium-resolution frames and computed at the scale of the spacecraft film). theoretical or geometrical ground resolution of the medium-resolution photographs (in meters). The resolution constant is equal to the slant range along the camera axis, in km, divided by 46 and multiplied by 7.62. The value for the high-resolution photograph is smaller by a factor of 7.62.
intersection of the camera axis with the lunar surface. distance from the spacecraft camera to the principal ground point. 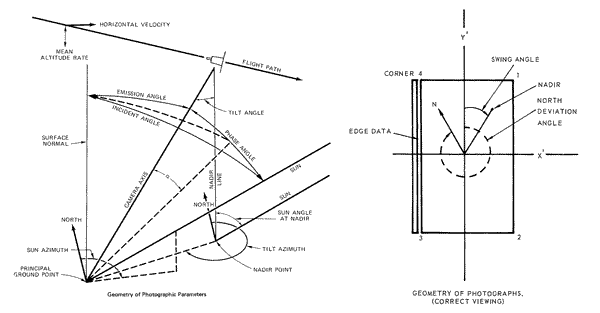 selenographic coordinates of the corners of ground coverage by each photograph. To facilitate the location of the principal named lunar features, an alphabetical listing is provided in table 3 identifying the feature, the plate on which it can be found, and the corresponding Lunar Orbiter photograph number. The associated Lunar Aeronautical Chart (LAC) published by the Aeronautical Chart and Information Center, U.S. Air Force, St. Louis, Mo., is referenced. The LAC charts are based on telescopic observation and may be updated by use of Lunar Orbiter photographs. These charts were of great assistance in locating features on Lunar Orbiter photographs. Where charts were not available, Kuiper's "Rectified Lunar Atlas" was used. Table 3 by no means covers all identifiable features, only about 450 of the most prominent features. Catalogs (see bibliography) prepared by the Lunar and Planetary Laboratory, University of Arizona, list approximately 7000 features and give selenographic coordinates and other pertinent data. The areas covered by the high-resolution photographs are typically too small to include all, or even most, of a mare. Accordingly, the maria are not specifically identified and located on the high-resolution photographs; they are indicated only on the medium-resolution photographs. Since identification of the maria is helpful in obtaining the proper perspective, these areas are identified on many more photographs than are referenced in table 3. The photographs (plates 1 to 675) are reproduced in 300-line-per-inch halftones at 55 percent GRE scale. They are oriented with north at the top of the page. 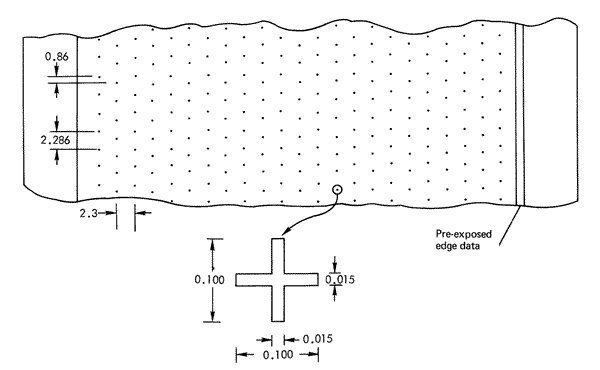 Because of different orientations of the spacecraft, the edge data may appear on either the right or left margin. Several of the support parameters useful in interpreting the photographs are given in the lower margin. Each high-resolution photograph is presented in three sections. Because of the unequal lengths of the sections, the center coordinates given at the bottom of the photographs are located only approximately in the center of the middle section (designated H2). An approximate scale is provided to help in estimating the size of the prominent lunar features; for comparison, the width of a framelet is approximately 1 cm. The alphanumeric coordinates of major features are given at the bottom of each photograph. For quick reference as to location, a sketch of a lunar globe with a cartographic coordinate system is included with each photograph. The centers of medium-resolution photographs are indicated on the globe by a cross. The outline of the entire high-resolution photograph is drawn on the globe with the particular section darkened. The sequence in which photographs are presented in this Atlas has no relationship to a specific mission or the order in which exposures were made on each mission. Rather, a plan similar to that used by ACIC in their LAC charts and Kuiper in the "Rectified Lunar Atlas" was adopted. The Moon is viewed with north at the top. The near and far sides are treated separately. Beginning with the near side, the photographs are presented by starting at the northwestern limb, sweeping to the right to the northeastern limb, then moving southward, and repeating the procedure. The result is six bands running west to east. The same left-to-right procedure was used on the far side, although, the coverage was not as orderly and symmetrical. The medium-resolution photograph is generally presented first, always on a left-hand page, followed by the three sections of the corresponding high-resolution photograph. The reference globe in the lower outside edge of the page permits rapid location of a plate showing a particular area. In a few cases, medium-resolution photographs were significantly degraded and are not included. To maintain an orderly sequence, however, intentional blank pages have been substituted. No data are lost by the omission, since these areas are adequately covered in adjacent photographs.